Once again it’s Autumn in the Colorado Rockies. In recent days it sometimes seems like half of Colorado is on high country roads tracking down leaf-gold. For weeks now the media has been trumpeting the annual aspen gold-rush and guessing when it would happen—and where. We always enjoy it when we get fall visitors as that gives us a good excuse to take full advantage of the season. This year, for some time now, our dear friends, Bob and Bev Mendenhall from Texas, have been calling, or e-mailing us asking when they ought to drop everything and head north so as to be at Maroon Bells on a peak day. Last year, we missed peak so they didn’t want a repeat of that! Problem is that peak color comes in Eastern Colorado at a different time than it does in Western Colorado. Not only that but colors turn at different times depending on elevation. Colors varied: from Minturn to Leadville to Copper, colors were at peak. Coal Creek Canyon was disappointing as too much summer rain had resulted in a fungus that shriveled the leaves. Peak to Peak Highway was sub-par but had patches of great beauty. Rocky Mountain National Park was about average, as was the Lake Granby/Winter Park area. Squaw Pass was average as was Mount Evans—but the wildlife was more than worth the trip: especially the rocky mountain goats grandstanding near the very top of the highest paved road in America. And there was the almost surreal sight of a 1926 Rolls Royce Silver Ghost racing up to the top. But then there was the piece de resistance: the two-day trip to Glenwood Springs, Aspen, and Maroon Bells. If we’d miscalculated its peak we’d have had some mightily disgruntled visitors! Not to worry: even though the colors along Maroon Creek were generally poor, past their prime, up ahead the ramparts encircling Maroon Lake (9,580′ elevation) were spectacular! 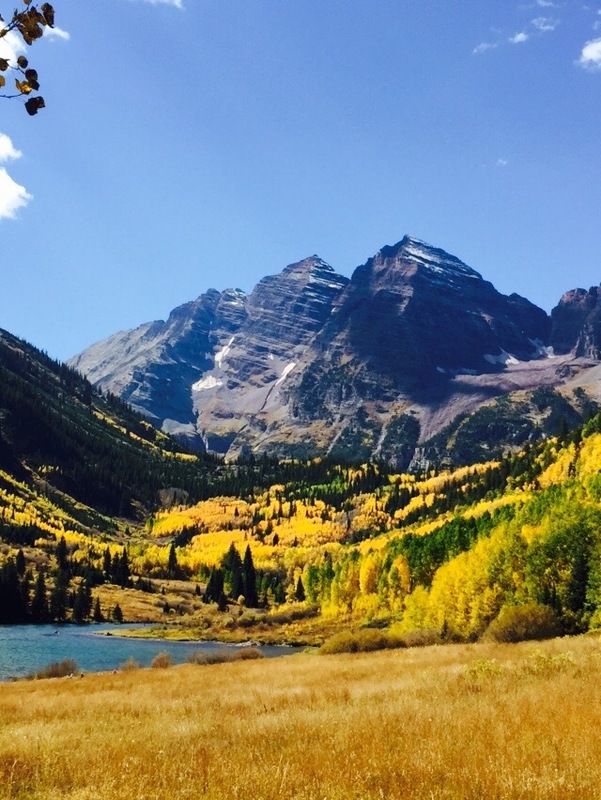 Combine still-green, gold, umber, and orange aspens; the iridescent blue-green lake, the reddish maroon mountain walls; the deep blue high country Colorado sky; and the three iconic mountain bells: Pyramid Peak (14,018′), North Maroon Peak (14,014′), and South Maroon Peak (14,156′), lightly dusted by a recent early fall snow, and you’ll have the most photographed spot in all Colorado. Indeed, it adds up to being one of the most breathtaking natural spectacles in the world, on the bucket lists of untold thousands of travelers. Like most of the enthralled visitors being bussed in, in a steady stream, we just didn’t want to leave; so we walked around the lake, took pictures, sat down on wooden benches, and dreamed in a sort of trance. Altogether: one of those extremely rare almost perfect days humans are granted so few of. Just wondering if the newest ‘Christmas in my Heart’ is available yet? Susie – we just got our first copy. Shipment will be available after October 28, when the rest of the books arrive here. Let us know when you want yours.